Make FREE 224 or 243 Bullets! 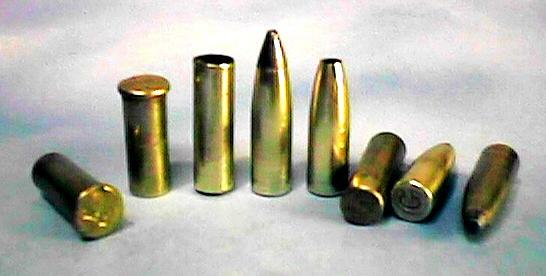 The kit makes it possible to produce high quality jacketed .223/.224 caliber bullets in the range of 50 to 80 grains. 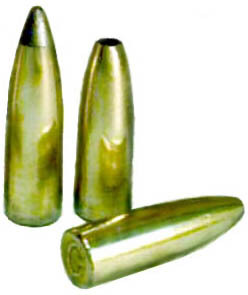 The .22 LR cases make their best bullets in the 52-60 grain range. 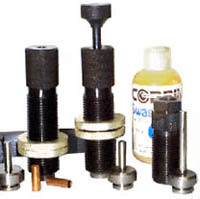 The same dies can be used with regular commercial bullet jackets. An extra core seating punch is provided for use with the commercial jackets. Open tip, lead tip, and full metal jacket styles can all be made with the set. For a higher quality lead tip, an optional LT-1-R 224 6-S lead tip forming die can be ordered. This reshapes the somewhat blunted lead tip into a spitzer shape for a more professional appearance. For additional weight control, the optional CSW-1-R core swage die can be ordered, which bleeds off surplus lead from the lead cores, leaving a fixed volume of lead on each stroke. The weight can be set by you by the position of the die in the press head. 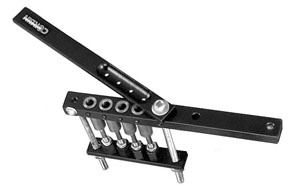 Use any sturdy reloading press that accepts 7/8-14 threaded dies and has a t-slot ram that takes standard RCBS type button shell holders with the Corbin KIT-224R or KIT-243R. 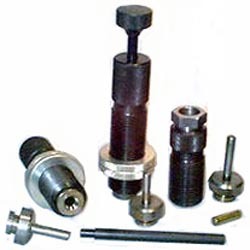 Progressive style presses, turrets and other special designs that do not accept a standard RCBS type button shell holder are not suitable. 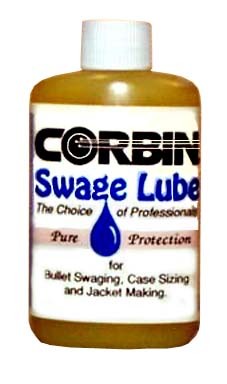 A kit can also be made for any of Corbin's own swaging presses. Usually these would include a core swage die. The FJFB-3-S die set, plus the RFJM-22S jacket maker, lead wire, core cutter, and swage lube would be the same components as this kit. You can substitute the CM-4 core mould in .185 diameter for the lead wire (LW-10) and core cutter (PCS-1). Orders may be placed by phone, fax, e-mail, or regular letter, and both VISA and MasterCard are welcome as means of payment. There is never an extra charge for using your bank card. Payment may also be made by check, money order, or direct wire transfer (call or write for procedure). Order on-line from our secure server shopping cart!